1.5 籽 *dzjɨ "to provide" "three offices" 三司 = "State Finance Commission"
2.2 牔 *tśjiw Transcribes Chinese zhou 州 "prefecture"
2.4 綃 *tśji Transcribes Chinese zhi 至, 治, 志, etc. 2.5 笐 *sə Transcribes Chinese shi 氏, si 司, 斯, etc. 3.2 蔘 *xụ̃ Transcribes Chinese hong 紅 "red", 洪, 弘, he 和, 河 etc. 3.3 義 *xjwã Transcribes Chinese xian 縣 "county"
3.5 炎 *tshjɨj "purple"; also transcribes Chinese qian 倩, qing 青, jing 靜, etc. 3.6 義 *xjwã Transcribes Chinese xian 縣 "county"
4.1 煏 *ljạ to pierce (also used in place names) ? 4.3 芇 *śjow "to guard"; also transcribes Chinese shang 尚, chang 昌, etc. 4.4 義 *xjwã Transcribes Chinese xian 縣 "county"
4.6 禿 *pjɨj Transcribes Chinese bian邊 "border"
4.7 義 *xjwã Transcribes Chinese xian 縣 "county"
5.5 牔 *tśjiw Transcribes Chinese zhou 州 "prefecture"
6.2 狽 *zjɨ̱r "water" 水 Black Water 黑水. The Ejin River in Gansu and Inner Mongolia, perhaps referring specifically to the Tangut fortress city of Kharakhoto (黑水城), known to Marco Polo as Etzina. 6.4 缚 *•ow Character used in Tangut surnames, of uncertain meaning here Black Mountains (the Wolf Mountains or the western part of the Yin Mountains 陰山 in Inner Mongolia). Transcribed in Chinese as 午腊蒻 wǔlàruò in the History of the Song Dynasty 宋史 vol. 485 (see Nie Hongyin 2008). 7.4 牔 *tśjiw Transcribes Chinese zhou 州 "prefecture"
7.6 牔 *tśjiw Transcribes Chinese zhou 州 "prefecture"
Having translated the above fragment, I thought it would be a fun idea to plot the place names mentioned in it on Google Maps, with the names given in Tangut script. 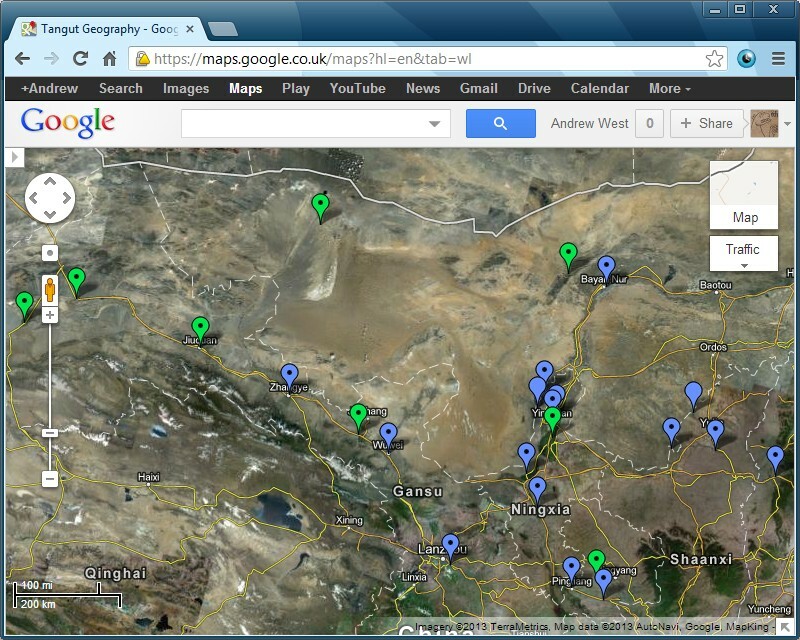 This I have done on the map below, with additional place names taken from other sources. Click on a tag to see the name of the place in Tangut characters. Note 1. Some Tangut place names are written with different characters in different sources, and where this is the case one spelling has been arbitrarily chosen. Note 2. Tags without a dot in the middle indicate that the exact location of the place is uncertain or unknown. 富清縣 Xinhure Sumu, Urad Middle Banner, Inner Mongolia. Site of the Black Mountain Fortress (Mongolian Uraqai, Chinese 兀剌海城). 黑山 The Wolf Mountains 狼山 or the western part of the Yin Mountains 陰山 in Inner Mongolia. May refer specifically to the Heishan Weifu Military Command (黑山威福軍司) garrisoned at the Black Mountain Fortress (Mongolian Uraqai, Chinese 兀剌海城) at Fùqīng County 富清縣. 賀蘭山 The Helan Mountains 賀蘭山. 五臺山 Perhaps the site of the Baisigou Square Pagoda in the Helan Mountains. Named after the the famous Buddhist mountain Wutaishan in Shanxi. 黑水 The Ejin River. May refer specifically to the Heishui Zhenyan Military Command (黑水鎮燕軍司) garrisoned at the Black Water Fortress (Mongolian Kharakhoto, Chinese 黑水城). 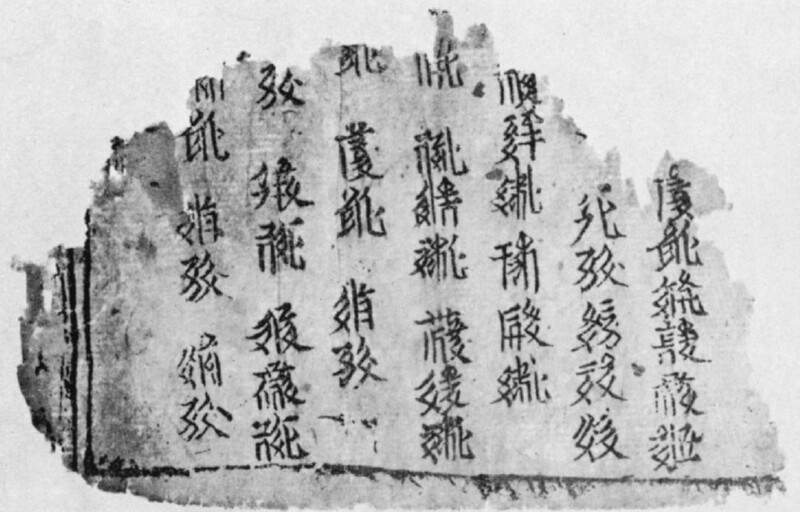 Grinstead, E. D., "Tangut Fragments in the British Museum"; The British Museum Quarterly vol. 24 nos. 3–4 (December 1961): 82–87. Huang Shengzhang 黄盛璋 and Wang Qianjin 汪前进, "New ideas about Xi Xia Di Xing Tu, the first and only map of Western Xia regime that has been handed down" 最早一幅西夏地图—《西夏地形图》新探; Studies in the History of Natural Sciences 自然科學史研究 vol. 11 no. 2 (1992): 177–187. Kychanov, E. I., The Revised and Newly Endorsed Code for the Designation of Reign ‘Celestial Prosperity’ (1149-69) Изменённый и заново утверждённый кодекс девиза царствования: Небесное процветание (1149-1169). Nauka, 1989. Nie Hongyin 聂鸿音, "Additional evidence on the Heishan Weifu Junsi" 黑山威福军司补证; Journal of Ningxia Teachers University (Social Science) 宁夏师范学院学报（社会科学） vol. 29 no. 4 (August 1008): 67–69.